There’s no doubt that traditional mashed potatoes are a staple of everyone’s holiday dinners. But maybe it’s time to start a new tradition. 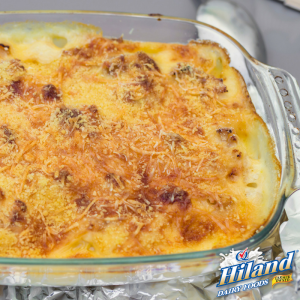 Our Hiland Creamy Potato Casserole recipe is sure to delight your friends and family, and it’s easy to make. Many families have their own versions of this dish — you’ll often hear it referred to as “Church Lady Potatoes,” so dubbed because it’s a staple at church socials and events. Regardless of what you call it, this potato casserole is rich, creamy and mouth-wateringly delicious. We’ve tried variations of the recipe and came up with our family-tested favorite. It’s the perfect addition to your holiday meals. Going to a holiday party? It’s easy to whip up a pan of Hiland Creamy Potato Casserole, and it’s sure to be a hit with everyone. Warning: Don’t plan on leftovers. Combine all ingredients in a large mixing bowl, mix well. Spread mixture evenly in a 9×13-inch baking dish. Bake covered with aluminum foil at 350°F for one hour. Uncover and bake for an additional 30 minutes. Serve warm.